Slurs are written above the staff for Voice #1 and below the staff for Voice #2. Do not cross through any stems or beams when writing a slur. When a rest is used in only one of the voices, the rest is written above the staff for Voice #1 or below the staff for Voice #2. When a rest is used in both of the voices, the rest is written above the staff for Voice #1 and below the staff for Voice #2. It is important that each "voice" (part, instrument, etc.) has the correct rhythm. For a Harmonic 2nd when one note is in Voice #1 and the other note is in Voice #2, it is important that the stems "line up vertically". So, the lower note head will not be to the left of the stem (as would be written in a Harmonic 2nd when written in "Keyboard Style"). Remember - in 2-Part Writing, the note for Voice #1 is written with a stem up, the note for Voice #2 is written with a stem down and the the stems line up vertically. There is a rule for dot placement for notes in a single melody - the dot is written to the right of the notehead, in the space beside a space note and in the space above the line for a line note. For Voice #1/Upper Voice, the dot is written to the right of the notehead, in the space beside a space note and in the space above the line for a line note. For Voice #2/Lower Voice, the dot is written to the right of the notehead, in the space beside a space note and in the space BELOW the line for a line note. For Voice #1/Upper Voice: above the staff and the stem. For Voice #2/Lower Voice: below the staff and the stem. 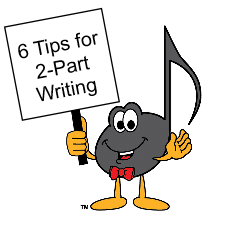 In Two Part Writing, there must be a note or rest for each voice. Thus, when both voices play the same note, there must be two notes shown (one for each voice)! Just like with the Harmonic 2nd, the stems will line up vertically. What do you notice about the dots for Harmonic Intervals of a first? Did you notice that the Harmonic 1st written in a space only has one ONE dot? This is simply because placing 2 dots in the space beside the notehead would create something called a "double dotted note", and that is something completely different. So - one shared dot for a Harmonic 1st written in a space. When the Harmonic 1st is written on a line, there are two dots - one in the space above for the upper voice and one in the space below for the lower voice. Two Part Writing - Any Other Questions? If you have any other questions about Two Part Writing, do not hesitate to contact me. Theory IS the foundation of music. 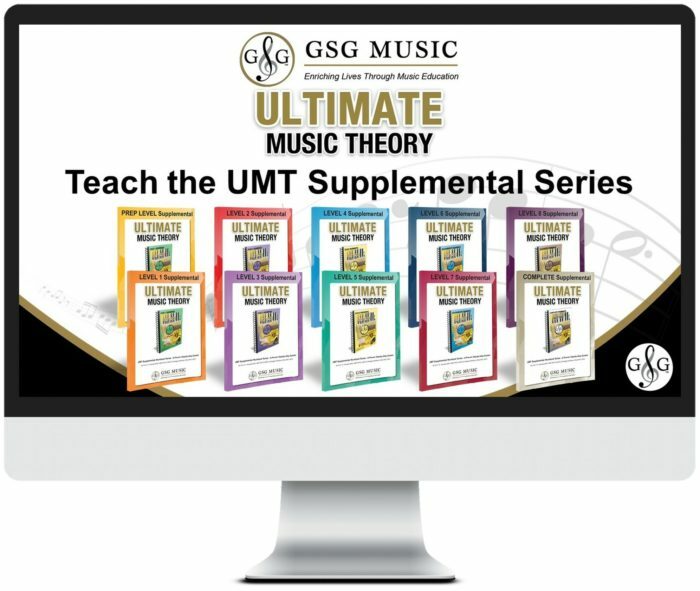 The Ultimate Music Theory Series will meet all your theory needs. For beginner students, and those students in the beginning levels of their Method Series (or in Prep A, Prep B or Level 1 RCM), start them in the Ultimate Music Theory Prep 1 Rudiments Workbook. Also start with the UMT Prep Level Supplemental Book to meet the criteria of the new RCM 2016 Theory Syllabus. For students in the more advanced levels of their Method Series (or in Level 2 RCM up to Level 7 RCM), start them in the Ultimate Music Theory Basic Rudiments Workbook. Also start with the UMT Level 3 Supplemental Book to meet the criteria of the new RCM 2016 Theory Syllabus.